This iExpression calculates the distance between two 2d or 3d layers. It can also calculate the distance only in a particular direction. Determines whether the total distance or only the distance in a specific direction should be calculated. Allows negative distances in order to distinguish different directions (only if distance is measured in x- or y-direction). 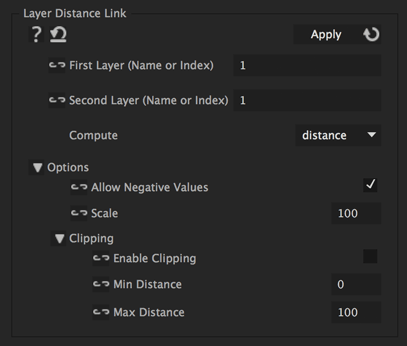 Allows to scale the computed distance value. Clips the computed distance value such that it always stays between the given minimal and maximal distance. If the computed distance is smaller than this value, this value will be returned. If the computed distance is larger than this value, this value will be returned.